The Saints have been very impressed with 2nd-year DT David Onyemata this offseason. They need a big development from the Canadian prospect to cover for losing their best DT, Nick Fairley, for the upcoming season to a heart condition that may end his career. 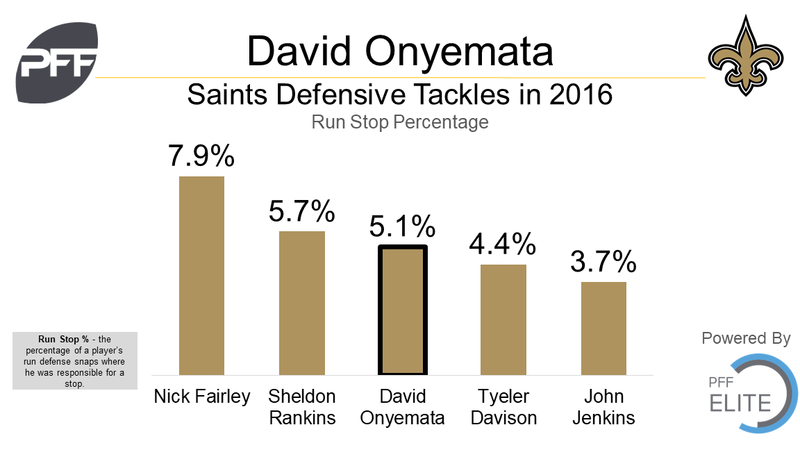 Onyemata’s run stop percentage of 5.1% was the 3rd-best on the team last season, finishing behind Nick Fairley and Sheldon Rankins. Going into 2017, Onyemata will look to build upon a strong finish to last season, in which he tallied 3 run stops against the Falcons’ high-powered running attack in the final game of the year, playing primarily on rushing downs in that game.